Ai Weiwei is super active in the world of contemporary art, posting to his Instagram, posing as a drowned Syrian refugee, decorating Berlin’s Konzerthaus with 14,000 life jackets. Not all of the commentary about him is positive, and I’m sure that’s as he would like it. He’s stated in the past that he desires uneasiness; that he deliberately moves away from the self-indulgent comfort of creating things to use his skills or to get praise. He wants to think critically and to act on his convictions. He wants to unsettle and to motivate. Definitely from his own perspective, he is a conceptual artist, a political activist, and an advocate for self-discovery. Ai’s art still depends—in a really essential way—on its visual impact. The striking visuals he’s able to concoct are the rhetoric he uses to promote his provocative agenda. He may not think of art as a “highly aesthetic practice,” but the work speaks for itself. Just think of his Sunflower Seeds. The work is less than compelling as a printed phrase: “One hundred million hand-sculpted, hand-painted porcelain beads, made to look like sunflower seeds.” As a realized artwork, it captivated people. Ai thinks about the forms as a means to an end—his end is pointing others to self-consciousness, sparking in us a challenge to accepted systems of belief, provoking critical responses and inspiring action—but they’re still necessary means. They are his way of communicating. He can’t even be sure that his art will communicate what he wants it to do. All he can be sure of is that viewers will experience the physical artwork. Many of us who look at his works will come away with different conclusions; such is the open-endedness of art, politically-driven or otherwise. All we have is the thing, so I say, let’s look closely at it. SAM’s one work by Ai Weiwei, Colored Vases, is on view at the Asian Art Museum in Volunteer Park. It delivers what it promises. Nine ceramic vases are arranged in a pattern much like a bowling pin setup—there are three rows, with four vases in the back row, three in the middle row, and two in the front row—only the headpin is missing. The artist has applied a base coat of industrial paint in a bold hue—such as yellow, pink, lime green, or plum—to each vase. A second color in high contrast to the base layer covers the lips and shoulder of the vase, then drips down the body. Some vases have long drips like the tendrils of a plant, while others are shorter, like polychrome stalactites. The paint drips are irregular, and they seem natural. Contrast is especially important to this work: there’s contrast between the traditional form of the ceramic vases and the bright and contemporary paint colors applied to them; contrast between the two colors on one vase, and contrast in the range of colors among the whole group; contrast between the normally grainy texture of a ceramic pot and the flatness of industrial paint. There’s probably contrast, too, between what Ai Weiwei thought of and what you take away. “Reconsidering Reality: An Interview with Ai Weiwei.” In Ai Weiwei: According to What? Edited by Deborah E. Horowitz. Prestel Verlag: Munich, London and New York, 2012. Published in conjunction with the exhibition of the same name, organized by the Mori Art Museum, Tokyo, in association with the Hirshhorn Museum and Sculpture Garden, Smithsonian Institution, Washington, D.C., and displayed at the Hirshhorn Museum and Sculpture Garden, Washington, D.C., October 7, 2012-February 24, 2013; the Indianapolis Museum of Art, Indianapolis, Indiana, April 5-July 28, 2013; Art Gallery of Ontario, Toronto, Ontario, August 31-October 27, 2013; Pérez Art Museum Miami, Miami, Florida, November 28, 2013-March 16, 2014; and Brooklyn Museum, Brooklyn, New York, April 18-August 10, 2014. “Making Choices.” Translated by Philip Tinari, from The Grey Book, November, 1997. Reproduced in Ai Weiwei. Phaidon Press: New York, 2009. 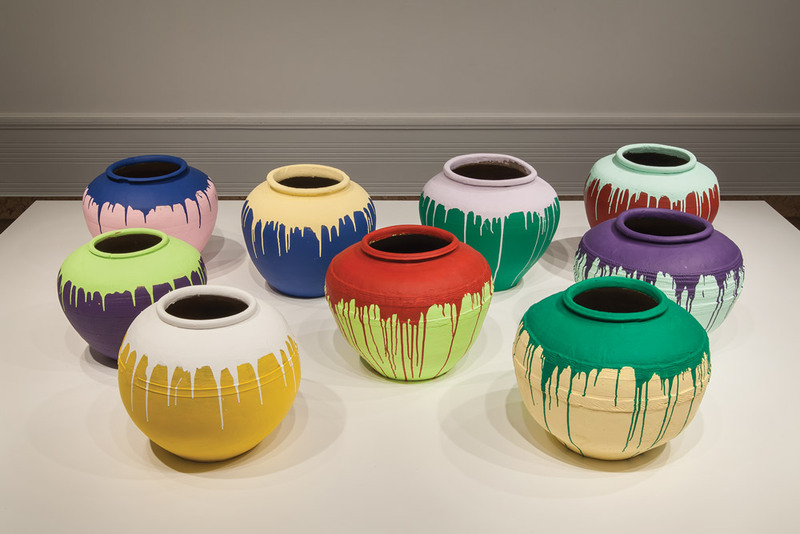 Image: Colored Vases, 2010, Ai Weiwei (Chinese, born 1957), ceramic with industrial paint, approx. 17 x 22 in. each. Seattle Art Museum, Purchased with funds from the Estate of Robert M. Shields, 2013.33, Photo: Nathaniel Willson.